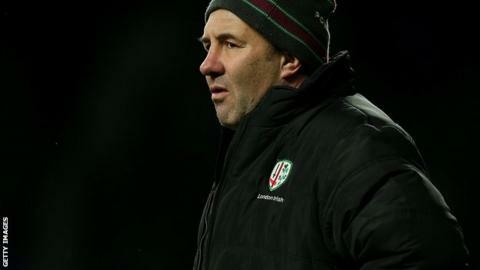 London Irish head coach Tom Coventry says his side must "hold their course" as they continue to search for a first Premiership win of the season. Irish lost 15-33 against Wasps at Twickenham on Saturday - their fifth defeat in five Premiership matches. The result saw The Exiles drop to the bottom of the table after also winless Newcastle drew against Sale. "We don't want to go back to the club and become too negative in what we're trying to do," Coventry told BBC Sport. Irish scored two tries through teenage centre Johnny Williams in the second match of the London Double Header. But, Wasps scored four of their own to secure a bonus-point victory and their first away Premiership win of the season. "We just have to hold our course," Coventry added, who took over team management in the summer. "The competition is about winning and getting points to move up the ladder and we need to get rid of that duck obviously. "We'll be striving to do that in a positive manner. We're still competing with some of the better clubs in the competition, that's where we aspire to be. "We've just got to get over that hurdle, which is difficult when you're losing confidence. "But, I'm sure when we put in a good performance that confidence will come back."